Following this philosophy, in a recent move by Government of India, a surprising address was made on 8th November 2016 to abolish the current legal tender notes of Rs.500/- and Rs.1000/-. 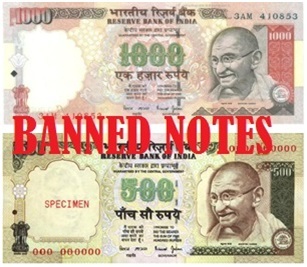 Whereas the notes of 100, 50, 20, 10, 05, 02 and 01 rupee will remain legal tender as of now. This move makes it clear that the current legal tender money of denomination 500 and 1000 has become illegal for undergoing any transaction. Through this case study we aim to highlight the brighter side (advantages) of this momentous step that has brought a radical change and brought the nation to a halt. 1. By abolishing the currency notes of denomination five hundred and one thousand, government aims to curb the menace of black money. 3. The economy is witnessing unaccounted hidden huge cash which in turn is escalating the of properties, land, houses, jewellery etc and the hard earned money is losing its value; hence, this trend will also come to a halt and stability in the prices can be seen. 4. One of the global issue(s) which is the root cause of sparring international relations “TERRORRISM” will also be curtailed. 5. The crime rate which has become a menace in the society will also be curtailed. 6. Another challenge was a cause of worry for India’s economy i.e. circulation of “Fake Currency”. This practise will also stop because fake currency printing for less value notes will not be viable. With all these benefits of abolishing the notes of five hundred and one thousand denominations, we hope that an honest Indian citizen would certainly support this change.